My///M3 Novillo leather treatment with pics. 1) Does it take the wrinkles out of the leather? Mine are already starting to get creases after 3 weeks. 2) What do you use as regular clean maintenance or touch up stuff? 2. Damp cloth weekly, touchup with leather masters normal cleaner. 1-Wrinkles because the leather is stretched and when you do nothing ,you will get cracks into this area's when the leather is parched, and then it's too late ! 2-My maintenance of the leather is damp cloth ,everytime when i wash the car. I do this Leatherique treatment 2x/year,and i think you have seen my pics....well this leather is from 2008 and has 50,000 km on it ! I have been tried all brands of products and with Leatherique i had the best result,example.....before my ///M3 i had a 325i(AC-Schnitzer) for almost 20 years and with 325,000 km on it and the black leather was also treated with Leatherique and no cracks on it......amazing stuff ! Got up and applied the first application this morning. 1) Start in the middle of the back seat and work your way outwards. 2) In the E90, under the "oh $hit" handles are hooks for hangers. These work perfectly for hooking the seatbelts (even the middle one) and keeping them off the leather while you apply it. 3) Use a spray bottle to spray, then rub in with your hands. You'll waste a lot less product and cover a lot wider area. So the Leatherique won't take the wrinkles out? Damn. I just freakin got the car! A wet rag won't help the leather get rejuvenated either! Did you treat your day 1 or something? I find it hard to believe leather doesn't get some creasing in it. I figured it was normal since I just got it. These are the wrinkles I'm talking about. Actually I liberally applied McGuiers leather conditioner to my seat and it has reduced the wrinkles for sure. Gave it time to soak in a few days. But when I sit on the seat I notice the top part just stretching the leather and all the creases being made by my weight. I figure there's no getting around that, although my old 328 leather has no wrinkling issues whatsoever but it also it a much more stiff leather. Those dark spots you see on the leg adjustment piece is from the leather conditioner, apparently that's a different kind of leather that shows much more shiny than the navillo. Last edited by ///M Power-Belgium; 09-10-2013 at 06:54 PM. How do you guys apply the oil in the winter when it's cold? Will it still work? I was thinking of letting the car run for a bit with the heat on, but that would only last for a few minutes before the car cools down after you turn the ignition off. You said you do it 2x per year, do you do it in a heated garage or something? Well, I noticed the driver's seat is getting some signs of wear in the leather. Even though the car is only 5 months old, I want to put some of the oil in it to protect it. Do you think it is a good idea? The problem is that it is already getting cold here, maybe 12 degrees C during the day. Is it still worth putting it on? I could do even just a little bit, I'm sure it will get absorbed a bit if I leave it for a couple days. I could also use Megiuar's leather care, it worked pretty well on my Accord. It leaves a bit of a shiny look, but I could clean it out with Prestine Clean! I only have front heated seats, but actually I think that's fine because the rear seats are rarely used! Thanks for the suggestion, I wonder if the seat heating works without ignition on. Plus luckily the last few days have been HOT. Hopefully it stays like this until I receive the order. Good to hear man ! Last edited by ///M Power-Belgium; 11-16-2013 at 01:58 PM. Spot on my friend ! When you used your heated seats a lot ,surely than it was even worse,like i said above, i saw cars with stretchd leather caused by heated seats and very bad ! Or this...you said about that you sweat a lot,now can you see that your seat is wet from your sweat ? Actualy this can cause the stretch too... ! 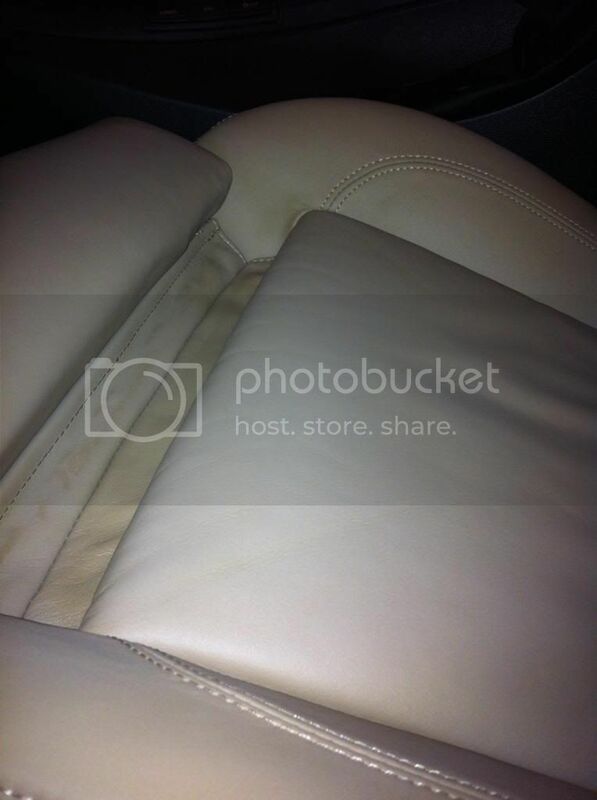 Maybe you should talk with your BMW dealer about this problem...maybe something with the leather in the sit area of your driver seat ? Last edited by ///M Power-Belgium; 11-16-2013 at 07:40 PM.